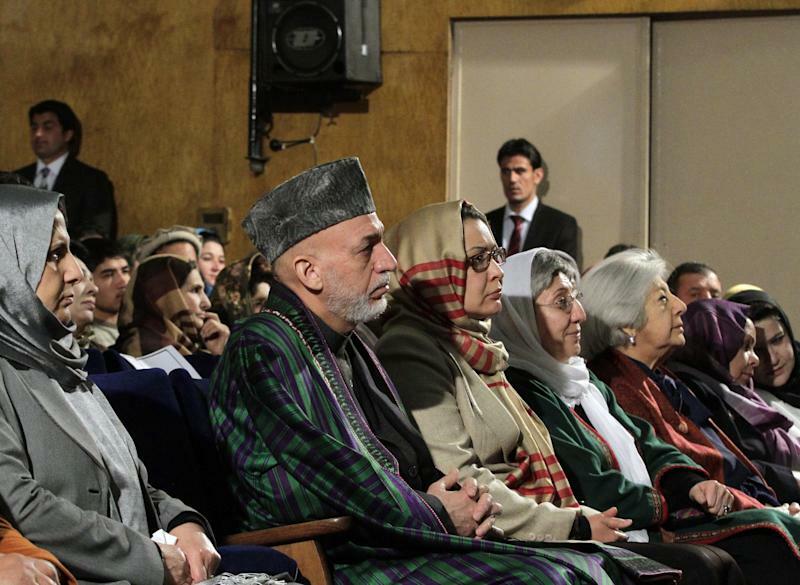 KABUL, Afghanistan (AP) — Afghan President Hamid Karzai on Sunday accused the Taliban and the U.S. of working in concert to convince Afghans that violence will worsen if most foreign troops leave — an allegation the top American commander in Afghanistan rejected as "categorically false." Karzai said two suicide bombings that killed 19 people on Saturday — one outside the Afghan Defense Ministry and the other near a police checkpoint in eastern Khost province — show the insurgent group is conducting attacks to demonstrate that international forces will still be needed to keep the peace after their current combat mission ends in 2014. "The explosions in Kabul and Khost yesterday showed that they are at the service of America and at the service of this phrase: 2014. They are trying to frighten us into thinking that if the foreigners are not in Afghanistan, we would be facing these sorts of incidents," he said during a nationally televised speech about the state of Afghan women. Karzai is known for making incendiary comments in his public speeches, a tactic that is often attributed to him trying to appeal to Taliban sympathizers or to gain leverage when he feels his international allies are ignoring his country's sovereignty. In previous speeches, he has threatened to join the Taliban and called his NATO allies occupiers who want to plunder Afghanistan's resources. U.S. and NATO forces commander Gen. Joseph Dunford said Karzai had never expressed such views to him, but said it was understandable that tensions would arise as the coalition balances the need to complete its mission and the Afghans' move to exercise more sovereignty. "We have fought too hard over the past 12 years, we have shed too much blood over the last 12 years, to ever think that violence or instability would be to our advantage," Dunford said. The Karzai government's latest comments and actions come during U.S. Defense Secretary Chuck Hagel's first visit to Afghanistan since becoming the Pentagon chief, a trip made in part to meet with Karzai. Hours after Karzai's speech, their joint news conference was canceled by officials citing security concerns, though officials said the two men still planned to meet privately. The two men had plenty of contentious issues to discuss. The Afghan and U.S. government are negotiating a security pact for the long-term presence of American forces in Afghanistan — the difficulty illustrated when a deal to transfer a U.S. prison outside of Kabul to Afghan authority on Saturday fell through at the last moment. U.S. and Afghan officials are also at odds over a Karzai demand that U.S. special operations forces withdraw from a province neighboring Kabul by Monday over allegations they participated in torture and extrajudicial killing — charges U.S. officials deny. As the deadline approached, Dunford told reporters he spoke to Karzai about the issue on Saturday and told him the U.S. is working on a plan to hand over security in the Wardak region to Afghan forces. He would not directly say whether the commandos will stay in Wardak when the deadline to leave comes on Monday. Karzai raised another difficult issue when he denounced the alleged seizure of a university student Saturday by Afghan forces his aide said were working for the CIA. It was unclear why the student was detained. Presidential spokesman Aimal Faizi said in an interview with The Associated Press that the CIA freed the student after Karzai's staff intervened, but that Karzai wants the alleged Afghan raiders arrested. The president issued a decree on Sunday banning all international forces and the Afghans working with them from entering universities and schools without Afghan government permission. The CIA declined to comment. NATO spokesman Lt. Col. Les Carroll said that no NATO forces "harassed a university student" as described by the President's office. In the incident at the Kandahar university Saturday, presidential spokesman Faizi said the raiders fired shots as they grabbed student Abdul Qayoum, and blindfolded him before taking him for interrogation at a CIA post that Taliban leader Mullah Omar once used as a home. The CIA has trained an Afghan counterterrorist force several thousand strong, known as the Counterterrorism Pursuit Team, which works mostly in insurgent strongholds in southern and eastern Afghanistan. U.S. officials say they work in concert with the Afghan intelligence service, but Karzai frequently complains he lacks oversight over their operations. 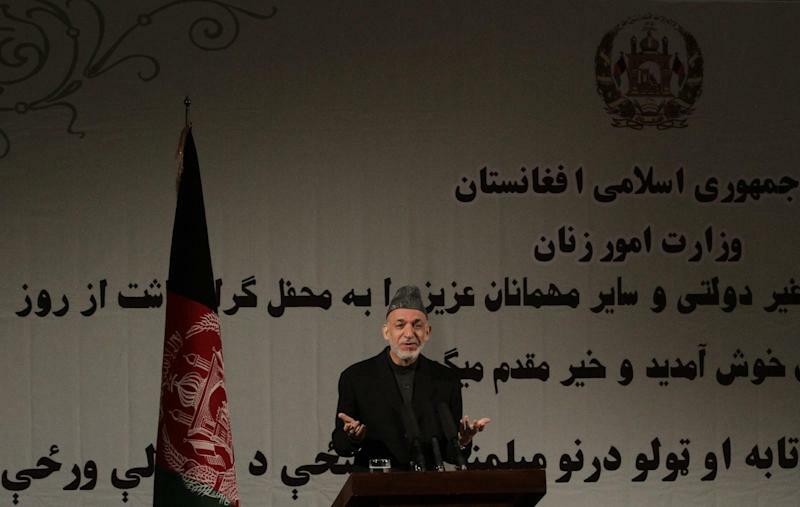 Karzai said in his speech that any foreign powers that want to keep troops in Afghanistan need to do so under conditions set forward by Afghanistan. "We will tell them where we need them, and under which conditions. They must respect our laws. 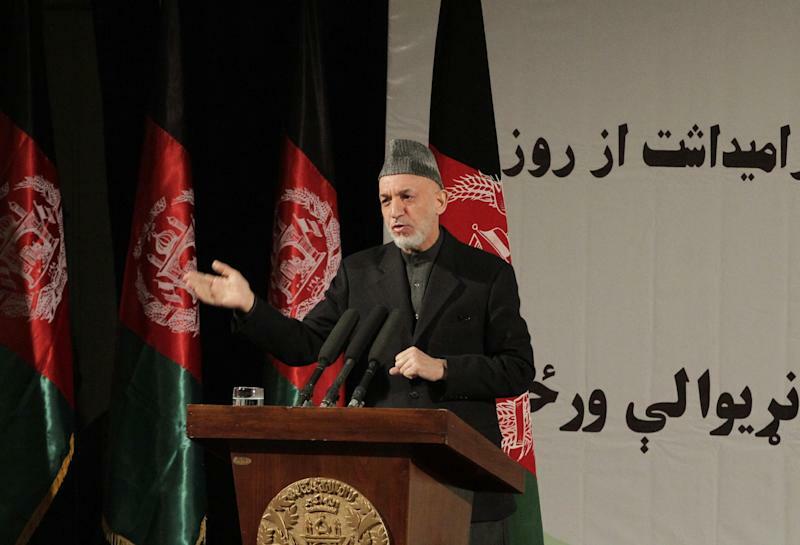 They must respect the national sovereignty of our country and must respect all our customs," Karzai said. Karzai offered no proof of coordination, but said the Taliban and the United States were in "daily negotiations" in various foreign countries and noted that the United States has said that it no longer considers the insurgent group its enemy. The U.S. continues to fight against the Taliban and other militant groups, but has expressed its backing for formal peace talks with the Taliban to find a political resolution to the war. Karzai said he did not believe the Taliban's claim that they launched Saturday's attacks to show they are still a potent force fighting the United States. "Yesterday's explosions, which the Taliban claimed, show that in reality they are saying they want the presence of foreigners in Afghanistan," Karzai said. Follow Dozier on Twitter at: http://twitter.com/KimberlyDozier; Baldor at http://twitter.com/lbaldor; and Vogt at http://twitter.com/HeidiVogt.